Named for its proximity to the almost, if not completely extinct Arrow glacier of mt. Kilimanjaro. It is mainly used by ascending climbers on the western breach route, who spend a night at the camp before attempting to scale an almost vertical wall — the western breach. Although other routes such as Lemosho, Shira and the Northern circuit, go through or at least near the camp, most do not use it for accommodation. The camp is a tents only camp with no built structures apart from the toilets, which are pit latrines inside a small wooden hut. Due to the difficulty of the western breach route that requires special permission, the camp is seldom used. The camp is also only used during the ascent to the summit, the descent takes on a different route. 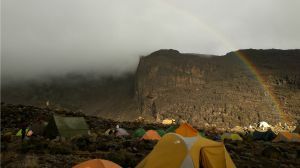 Arrow glacier campsite is located in the eastern part of Kibo, mount Kilimanjaro's highest peak. It is also is within view of the Western breach, a feature that was formed as a result of a large land mass falling from the sides of Kibo, leaving a scree filled slope on top of which is an almost vertical wall about 100m in height. The campsite is also in the alpine desert region of the mountain, an area with high winds, almost no rainfall and low humidity. 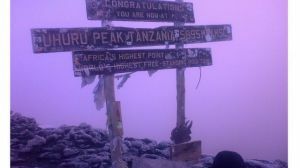 On some occasions, snow may fall at the campsite, making this one of the few places in Tanzania where you may see such a phenomenon, given its location close to the equator. Some ice may at times form during the night from moisture condensation. There is absolutely no flora or fauna near the campsite apart from a few critters such as spiders. Are you associated with Arrow Glacier campsite? Contact us to improve this page or create another page for your business.